When 43 of the nation’s top educators come together, magic happens. 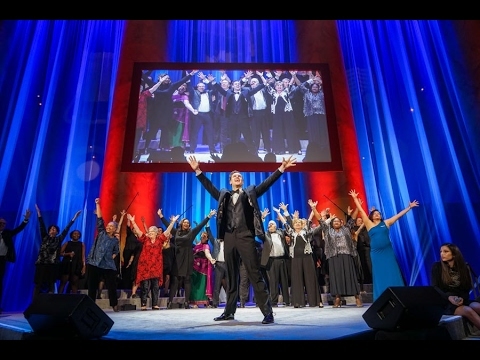 One of the best moments of the NEA Foundation’s Salute to Excellence in Education Gala 2017, held on February 10 in Washington, D.C., occurred when educator Craig Beals, of BealsScience, made it snow onstage! And when previous NEA Foundation Global Learning Fellowship Recipients and others performed a flash mob-inspired opening number! Educators perform “It’s a Teacher’s Life” at the NEA Foundation Gala. Watch their performance with Christopher Rice, of the Tony Award-winning Broadway play, “The Book of Mormon,” and Washington, D.C.’s All Souls Choir. Host Victoria Rowell, an actress, advocate, and New York Times bestselling author, helped the more than 900 guests and hundreds of live stream viewers cheer on the 43 educators who received the 2017 California Casualty Awards for Teaching Excellence. Of those 43 educators, five finalists also received the 2017 Horace Mann Awards for Teaching Excellence and $10,000. In the evening’s nail-biting finale, Sonia Galaviz, a fifth grade educator at Garfield Elementary School in Boise, Idaho, took home the top honor: the NEA Member Benefits Award for Teaching Excellence and $25,000! Watch the video featuring Sonia Galaviz that premiered during the gala. The NEA Foundation also recognized Global Kids for helping students become active citizens in their own communities and in the world with the First National Bank of Omaha Award for Outstanding Service to Public Education. Miss any of these moments? See all of the top tweets from public education’s big night,view and purchase your favorite shots from the photo booth, or re-watch the full event! We greatly appreciate your generous support to help make the NEA Foundation Gala the perfect evening of celebrating educators! A special thanks to our corporate gala sponsors at the Genius and Sage levels, including American Fidelity, Bank of America, California Casualty, First National Bank of Omaha, Horace Mann, NEA Member Benefits, and Promethean.